Dr. Zeina Nahleh and her daughter. In the United States alone, there are over 10 million cancer survivors – facing a complicated and life changing experience. Survivors, as well as their families, need coping strategies to face difficult emotions following this life altering experience. To assist families during this transitional time, the Texas Tech University Health Sciences Center at El Paso Garbar Breast Care Center started the first and only comprehensive survivorship program in the area for breast cancer patients who have completed their active cancer care. The program provides survivors with a summary of all the treatment they’ve received, addresses emotional and psychological issues such as anxiety and fear of recurrence, and their nutritional needs. Over the past six months, 50 breast cancer survivors joined the survivorship program, which has been well received. “We hope to expand the survivorship program in the future to involve survivors with other types of cancer,” said Dr. Zeina Nahleh, associate professor of medicine and biomedical sciences and chief of the Division of Hematology-Oncology in the Department of Internal Medicine. Get a summary of your treatments. Have a list of what surgery, radiation and chemotherapy doses you received so that you can communicate these to your primary care providers. This will help you plan for the next tip on the list. Learn how to manage the fear of cancer coming back. First, find out your risk of recurrence from your health care provider. Second, remember that risk is based on averages and does not apply to you as an individual. Third, consider counseling or other assistance to help you face your fears and move forward. Get moving. If you pick one healthy thing to change in your life, physical activity is likely to make the fastest change in how you feel and also potentially reduce your cancer-related risks. Make opportunities to walk or take stairs. Find an exercise program to join to get you started if it’s just too hard to do alone. Eat well. Your diet doesn’t have to be perfect, but fruits, vegetables and whole grains can make a difference in how you feel. Starting to eat more healthy foods can make it easier to avoid the things that add weight or complicate digestion. Talk to a nutritionist if you are unsure what is healthy for you or if you have digestion problems. Live a healthy lifestyle. Exercise and nutrition are part of the picture, but not the whole. To help ensure your long-term survival and a better quality of life, don’t smoke, limit alcoholic drinks to one per day, and use sunscreen to protect your skin. Make sure you get sufficient vitamin D. Your doctor can do a blood test to determine the amount of vitamin D in your body and make recommendations for how to get the right amount. Reclaim your body. Most women gain weight following cancer treatment. Weight control is important. Menopause, tamoxifen and aromatase inhibitors can lead to body changes and weight gain. Check with your doctor and a nutritionist and consider joining an exercise program to help you control your weight and build muscle instead of fat. Manage symptoms. Don’t suffer unnecessarily. Talk to your doctor if you have fatigue or lack of stamina that does not improve with time, chemobrain that makes it hard to work or remember what you need to do, or other aches, pains and symptoms that make it hard to enjoy your life. Make an appointment to focus solely on the symptoms that reduce your quality of life. Make use of resources. There are lots of options in the community and online for cancer survivors and especially breast cancer survivors. 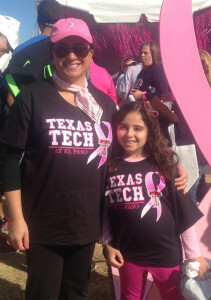 To learn more about the TTUHSC Garbar Breast Care Center, go to http://elpaso.ttuhsc.edu/gbcc or visit http://www.kint.com/2014/02/27/unidos-por-una-cura-3/ to view a story (in Spanish) featured on Univision.